“Poems of My Faith” from Christian Faith Publishing author Anna Cullefer Ferry is an artistic and glorifying depiction of the author’s faith and love for God. “Poems of My Faith”: a heartwarming look at the authors faith, and how it has not only guided, but also enabled Ferry to overcome many hurdles in the journey of life. “Poems of My Faith” is the creation of published author, Anna Cullefer Ferry, a retired school teacher and current homemaker. Ferry received her bachelor’s degree in education from the University of Southern Mississippi. Ferry currently resides in Alabama with her husband Ned. Published by Christian Faith Publishing, Anna Cullefer Ferry’s new book is the heartwarming collection of poems inspired by the authors emotional connection with not only faith in God, but with the struggles of coping with heartache and loss. 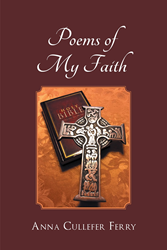 View a synopsis of “Poems of My Faith” on YouTube. Consumers can purchase “Poems of My Faith” at traditional brick & mortar bookstores, or online at Amazon.com, Apple iTunes store, Kobo or Barnes and Noble. For additional information or inquiries about “Poems of My Faith”, contact the Christian Faith Publishing media department at 866-554-0919.